There are several reasons why men often avoid discussing their health, including a fear of receiving bad news. In fact, according to health experts, fear of bad news is the number one reason men avoid talking about their health—among themselves, with their partners, or with their healthcare providers. This is unfortunate, because a failure to tackle health problems head-on can make them worse in the long run. The good news is that addressing diabetes and related health concerns up front and early on can lessen their impact on your long-term wellbeing. But low testosterone is treatable, and the sooner you talk to your physician about the possibility of low testosterone, the sooner you can be treated. Ideally, once you do, you’ll feel better, you’ll have more energy, and you’ll reduce the risk of other health issues related to this condition—it’s a win-win! Another concern for men with diabetes is ED. 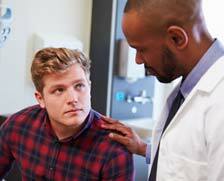 Even if you don’t have low testosterone, you can experience ED as a complication of diabetes. According to the American Diabetes Association (ADA), it's normal to feel embarrassed discussing such an intimate issue, but your healthcare provider is a professional who is there to help you, not judge you. Talking about ED is the only way to learn about treatments and to get the help you need. Along with medical treatment, adopting a diet and regular physical activity plan may help lessen the chances of developing ED and other issues related to vascular function, such as heart disease. The ADA notes that lifestyle choices that contribute to heart disease and vascular problems also increase the chances of ED. Smoking, being overweight, and being inactive can also contribute to ED. If you want to keep everything in working order, including your sexual health, your doctor can work with you on a plan that includes smart nutrition choices and regular exercise. Your doctor may also refer you to a diabetes educator or a registered dietitian. In the end, allowing yourself to be vulnerable enough to discuss—and properly manage—your diabetes-related health concerns is the most “manly” thing you can do. There’s nothing more masculine than taking care of business, including your own!